The “boyfriend” blazer continues to be a wardrobe staple and is a simple way to look chic. 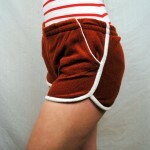 Another continuing trend is tunics over leggings, skinny pants or shorts. Solids are no longer a requirement for bottoms! You’ll see skirts and pants in all varieties of prints. 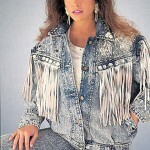 The denim of the 80s was a stiff unforgiving fabric—the fabric didn’t mold to us; we molded to it. I have a vivid memory from high school in the early 80s of me in my one and only pair of beloved Jordache jeans. Skin tight. Oh yeah. The usual method of lying on bed and exhaling didn’t work one morning, so there I was in the kitchen with my mom yanking up my zipper with a pair of pliers while I pulled the waistband tight. And let’s bear in mind, I probably weighed all of 105 pounds at the time. What I remember most from that morning is my mother muttering under her breath, “What am I doing?” What indeed. So skinny, tight jeans are back en vogue, but not to worry, because genius fabric technicians have apparently made important discoveries in the past twenty years. I’ve got a pair of skinny jeans from H&M that fit like a glove and feel like a pair of sweat pants. What’s in the magical denim blend? Spandex? Poly? I don’t know, and quite honestly don’t care. When something both feels mahvelous and looks mahvelous, I don’t ask questions. But I guarantee that Heidi Klum is feeling pretty cozy in the new Jordache. New fashion trend to be on the lookout for: The jegging. It’s leggings that look like jeans (see pic at top). 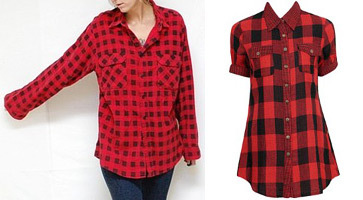 And boys like to look at them looking like girls, so today’s oversize shirts and sweaters come with a bit more tailoring to acknowledge our feminine curves. They are . . .
. . . less garbage bag, more figure-friendly. Are you sitting down for this one? 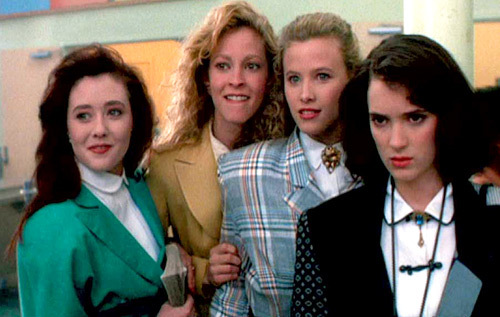 Good, because it may come as a bit of a shock — shoulder pads are coming back. You’ve probably heard about the ridiculous spectacle they’ve made on the runway, but we all know that’s just pretend and not something they expect us real people to wear, however, the buyers at the local fashion boutique tell me that shoulder pads are now creeping into the lines of mainstream designers. What’s the fashion industry’s damage? I say we stand strong on this one. We’ve thus far resisted stirrups on our leggings, we can keep the shoulder pads out of our jackets too. All we have to do is stick together and not buy them when they start popping up in our local boutiques and department stores. Are you with me? I prefer extreme shouldaerpads, like a suit with shoulderpads covered with a coat with shoulderpads…Makes you look more serious & imposing. When Marcy D’Arcy on Married with Children did it, it made her look like she owned the world.